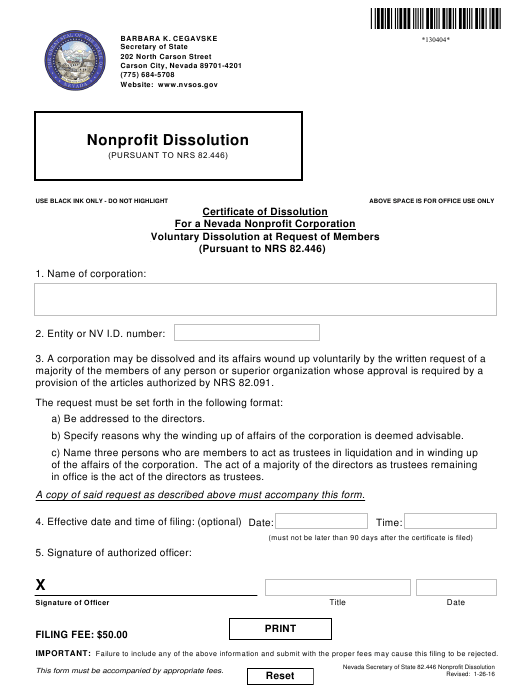 Form 130404 or the "Certificate Of Dissolution For A Nevada Nonprofit Corporation - Voluntary Dissolution At Request Of Members" is a form issued by the Nevada Secretary of State. Download a PDF version of the Form 130404 down below or find it on the Nevada Secretary of State Forms website. provision of the articles authorized by NRS 82.091.
a) Be addressed to the directors. b) Specify reasons why the winding up of affairs of the corporation is deemed advisable. in office is the act of the directors as trustees. A copy of said request as described above must accompany this form.